A few years ago we purchased a fixer upper (and that's putting it nicely). It actually was completely not habitable. Although most of it is finished, there are still a couple projects I've been wanting to get around to. One of them was to put a runner carpet down the front stairs. I priced the runner carpets and at minimum it was going to run us a few hundred dollars. If we wanted anything other than the basic run of the mill variety it was going to cost even more money. These little rugs were selling for $1.00 each. I measured them and they were the perfect length, but they were too wide. Each little rug cut in half the long way however would give me two perfect sized pieces to make my own Carpet Tread Rugs. I then headed to the fabric department to see if they had a fabric I would like. I found this lovely fabric for $4.99 per yard. I needed three yards. I think I actually could have done with two and a half but felt safer going with three. We then had to figure out a way to adhere the upholstery fabric to the rubber backed carpet pieces. In looking around the store my daughter and I found two things, glue and tape...crazy strong tape. I don't know what the tape is used for but the stickiness of it makes duct tape seem like a wimp. Sorry duct tape, I still love you and was going to use you if I had not come across your bigger, stronger, super hero cousin. I know someone will ask but I have no idea what this tape is. Mardens is a salvage store, this role had no packaging and looked just like this when we bought it. But it was huge and the price was right at $3.49. We purchased two bottles of this glue which said it worked on fabric at $5.99 per bottle, it was not enough glue. We ended up running to the hardware store which of course did not carry it, so we purchased a bottle of Weldbond which also said it worked on fabric. It also was $5.99 per bottle. First we cut all the carpet pieces we had in half. We then cut fabric pieces for each piece of rubber backed carpet. You'll need to cut your fabric just a bit larger than your carpet piece on each side. I didn't measure but I'd say it was about an inch or so on each side. If you decide to use this technique to make your own, you may need to center the fabric, it will depend on the overall print you choose. If possible, I would suggest choosing a fabric where centering the design will not matter. It will just be easier all around and will probably save you money as you won't have to figure on getting the repeat in the pattern right when you measure for fabric. I chose to center my fabric left to right but not front to back. We spread out the glue. We then flipped the carpet over so the glue side was down on the backside of the fabric. Then we cut a piece of tape the length of the long side of the carpet square. Unrolling the tape proved to be the most challenging aspect of this entire project. The tape was so sticky it took tons of strength just to unroll it. We did the same on each side. Oh, I almost forgot, we did run a bead of glue down the edge of each side right before folding the fabric and tape over the back. That's basically it. For each step repeat the same process. To attach these to the stair treads we used Scotch indoor carpet tape. We ran it down each short end, in the center and along the front edge. This is what the set looks like on the stairs. So here are my suggestions if you should decide to make your own carpet stair treads. Make sure the fabric you choose to use is a sturdy, heavy duty fabric such as an upholstery fabric. It also should be think enough that the glue won't ooze through because that would make a hard stiff top on your DIY carpet stair treads, and that would feel awful if you were barefoot. Over all this project took my daughter and I two and a half hours. Here is a break down of what we spent. Total: $46.93 I think we may have been able to do this for a bit less if we had shopped around for a larger bottle or different glue. But overall I'm happy to not have spent a few hundred. Another thing which I considered using and you may want to try is, to use burlap to cover the carpet pieces and then use some geometric shape and acrylic paints to put maybe stars or stripes or some other design on the pieces. Let me know if you try this project. I'd love to see pictures. No I did not use scotchguard. I used an upholstery grade fabric to make them and it may or may not have had it already...I don't know. No, the fabric did not pull up when I vacuumed, they just stayed put. Others who make these may have a different experience than I did however as I can think of a couple things which may or may not change the outcome (type of fabric used, how well it is glued down, type of glue used, type of rug being covered). No my vacuum did not pull up the threads. Again, I can imagine some people having a different experience based on the chosen fabric. If you decide to make these, make sure your fabric is not made up of many "threads" being sewn down onto another piece of fabric. Many chenile type fabrics are made this way, they appear durable but they are not. They stayed in place perfectly! That carpet tape stuff is pretty great stuff. In the year we used them, I didn't have to redo the tape on any of them. Yes, I would make them again and may possibly do so in my new home. Where to begin? There is so much to say, so much to tell. I promised all of you that I would fill you in on all that has transpired over the last three years, on our move to NH, on purchasing a not habitable house (again) and this time moving into it in that condition. Well, I guess that's it, that's my starting point. Three years ago our house in upstate NY sold. It had been on the market for what seemed like forever, truly. It took 2 1/2 years, and many price reductions before it sold. Needless to say, it was a very long 2 1/2 years. During the time our house was on the market, if I am completely honest, I must confess, we questioned God. We were tired of being wage slaves to large corporations who were making huge changes which greatly impacted my husband's salary. We had been praying about self employment and had asked the Lord for guidance. We felt He was leading us down the self employment path. So, when we put our house on the market and it didn't sell for 2 1/2 years, we had plenty of time to ask God, "Are you sure we were hearing you correctly?" And each time we asked God, we heard Him say "Yes, you heard me correctly, wait on Me." And again, if I am to be honest, I would have to say, my waiting was not always pretty, if you know what I mean. For those of you who have read "The Humidity Makes My Hair Frizz and It's Really Starting to Stink in Here", you are probably thinking, "what do you mean, the waiting wasn't pretty? haven't you learned that by now?" Well, the honest answer is, "No, not completely, do we ever, really?" I've come so far in my learning to wait on the Lord but as the saying goes, old habits die hard. So, we waited and waited for the house to sell, and then we waited some more. We had the house listed with a realtor for almost all of the 2 1/2 years. Then around the 2 year mark, I began taking things into my own hands. Now mind you, sometimes if you are taking things into your own hands, it is not a good thing, at those times, it is you taking control of things and taking it from God. In our situation, I believed, and still do, that I was doing it with the Lord's guidance, there's a big differenc. This is a difficult thing to discern and all I can say about it is, pray a lot! The renewal time for our contract with our realtor was approaching. We asked her if she would still list the house with the stipulation that we could also list it and market it ourselves (for sale by owner), as long as we never listed it for less than she had it listed while we were under contract, she agreed. We were fortunate in that regard because many realtors will not agree to this. However, the house didn't sell during that contract period. So the next renewal time came and the realtor was pressuring us to drop our price, again. We had prayed about this and felt we could not drop the price any further, pay the realtors commission, and still pursue the things we were feeling led to. So, when the contract ran out, we set the house up as "For Sale By Owner" exclusively, we had a contract in two days, I kid you not, two day! Because it was for sale by owner, we were able to drop the price one more time (because we would not be paying the realtors commission) and evidently that was the magic number. Tom and I had prayed a lot about the price we could or would accept for the house. A couple called us, came to look at the house and they returned with an offer. They came, sat in our dining room across from us, and slid a paper across the table with their offer on it. Tom and I excused ourselves to the other room to review and discuss it and when we opened the paper, it was the exact number we had been given from the Lord. We never counter offered, we never haggled, we never felt led to. We signed offer paperwork, shook hands and they left. Shortly after, we received a phone call from either them or their attorney, I can't remember, asking if we could be out in 1 week, no joke, 1 week. The house had been on the market for so long, I was afraid of rocking any boats, so I said "yes". During that week I was a crazy woman, I packed up a 3000 square foot house, a barn, a large 2 car garage, a 16' x 23' studio, and a 16' x 16' screenhouse building. I cleaned, I scrubbed, I hauled things to the thrift stores, but best of all, I corresponded via email with the woman who would be purchasing our home. I asked her if she would like the curtains in the living room, I asked if she would like my piano and other items. In addition, I put together a gift basket of goodies to welcome them to their new home. I also drew a map of the flower and herb gardens (as I had promised her) to tell her what was in them and where. These are not things which generally happen when you sell your home through a realtor. I feel so blessed to have sold our home through a "for sale by owner" situation. I know not everyone has had the same experience when selling "FSBO", but the Lord was without a doubt working in the sale of our home. So then I called my mom in MA. Now keep in mind, my mom has one of my brothers living with her. In addition to that, when I called her, my other brother who had lost his job, and his wife and their two children, and their dog, were staying at my moms house as well. So, I call her and say, "Hi, Mom, we're coming." That's right, all six of us and our dog, going to my mom's house where there were already six people living. My mom has a large house, but this would be really testing everything. By everything, I mean, her septic system, her hot water heater, her patience, my two brothers patience, my patience, cousin relationships, dog relationships, and even our trust in the Lord, yup, all of it. So we showed up at my moms, tired, homeless, jobless, and yet with a renewed excitement for what the Lord had planned for our future. We were walking away from the comfort and assurance of a weekly paycheck and putting it all in the hands of the Lord. Because it had taken so long for our home to sell, we had plenty of time to research, and we researched everything. We had decided upon starting a homecare agency and were planning on another business as well. But in choosing the area for our relocation many factors played a part. We began looking for a home in the area we felt led to, and we left the housing situation entirely up to the Lord. We looked at single family homes, multi-family home and we looked at two family homes. We totally left it up to Him. We did know that the house did not have to be forever, that it could be a stepping stone. I can not stress this point enough, that we left the choosing of the home entirely up to Him, because it was and continues to be such a huge factor in our relocation. One day we looked at a house and when my daughter and I walked onto the property, before even stepping inside, my daughter and I looked at each other and said, "I think this is the one". To this day, I can not tell you why other than it was the Lord. There is really nothing about this house which feels like "me" and yet I know it is where I have been meant to be. The other thing is, our house is in a neighborhood, and living in a neighborhood would not have been my first choice. Moving to a house with just a drive way between us and the next house was going to be a real change for us who had been living where the nearest neighbor was 1 mile away. So the realtor tells us before we see it, "It's in really bad shape, I don't think you're going to want it." Generally it is not a good sign when your realtor tries to talk you out of a house. But in the end she was wrong, we wanted it, or should I say, it's where the Lord wanted us. So we purchased an 1880 home in not habitable condition and moved in. For our prior home we had purchased a not habitable home as well but there we fixed things before we moved in. With this one, in a huge test of our faith, we'd be moving in, as is. This house was in another state from where we were living with my mom, so the option of traveling back and forth to do fix ups was not really an option. So we moved in. And this house was in really bad condition. This house was almost totally gutted. It was so gutted to the point that when you walked inside, you were looking at the back of the exterior siding. In addition, the prior owner had ripped out most of the wiring. There was no heating system, no hot water heater, and the pipes had burst. In addition it was also completely covered in asbestos, even the roof, as you can see in the pictures below. Evidently, back in the 1950's, some asbestos siding salesman had really done his job well when he knocked on the door to this house. One amazing thing about this move was we found, purchased, and were moved into this house within 1 month of leaving our prior home. That to me is a true testament to the work of God. Things just don't generally happen that fast with house purchases. I have had some women comment in regards to this move how they could never do something like this. They have hinted at my being so strong to be able to do such a thing...well, I'm not going to paint this as though looking through rose colored glasses, this was hard, real hard and was an enormous test of my faith. I'm thankful to the Lord that it was summer when we moved here and we could be outside a large amount of time because we were pretty much living in one room, all six of us. Here are a few pictures of the house. They are all before pictures. I will share some after picture with you soon. The house was completely covered in asbestos, even the roof. 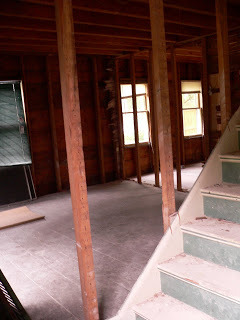 This is what most of the inside of the house looked like the day we bought it. This picture is looking into the room which would be our office. This is our future living room. This is the room on the first floor which we would all call home for at least 4 months. and this is the space which would become our bedroom and a bathroom. I know, it doesn't look like much now, but I'll post after pictures soon so you can see the finished result. So there you have it, the beginning portion of the story of our move to NH. I will continue to fill you in on the story over time. God said "I have come that you may have life and have it more ABUNDANTLY" I believe God wants us doing just that, living an abundant life, a life of purpose, a fulfilling life or even...a life of daring adventure. I'm on a mission to encourage women to do just that. Why? Because L.I.A.D.A. !